The Internet is certainly a magical place and has become the place to share information with everyone. YouTube has been one of the preeminent services to help people express themselves. But did you know that the video social network has physical locations where artists can go to get help with creating their videos? There are three such locations, with one being in Los Angeles. We had an opportunity to stop by the company’s space to find out what exactly goes on there and to see how seriously YouTube is taking the task of disrupting the traditional television broadcast medium. 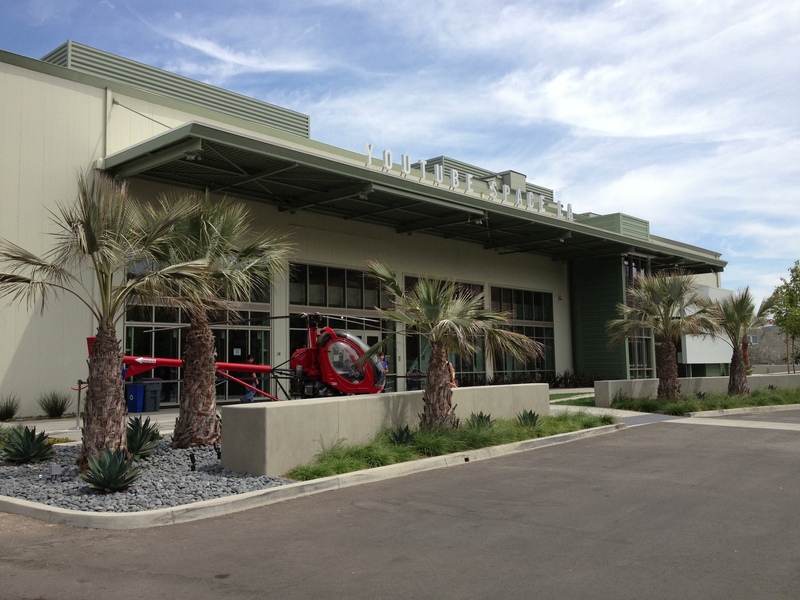 Located just minutes away from Los Angeles International Airport, YouTube’s creative space is a 41,000 square foot renovated hanger once owned by Hughes Aircraft (a company owned by Howard Hughes). At first glance when you’re driving to the space, it’s a rather inconspicuous building with no noticeable signage along the roadside telling you that you’ve arrived. The YouTube space is a dedicated building for creative people to follow through on their ideas and produce great content. We met up with Rob Polonsky, a company production strategist, who gave us a tour of the facility. He tells us that the space is considered to be YouTube’s flagship location. The idea behind the space is to promote three of YouTube’s principles: Learn. Share. Create. The space functions as a learning center and studio. Not everyone can use the facility. Polonsky says that only creators participating in YouTube’s Partner Program can use any of the spaces. 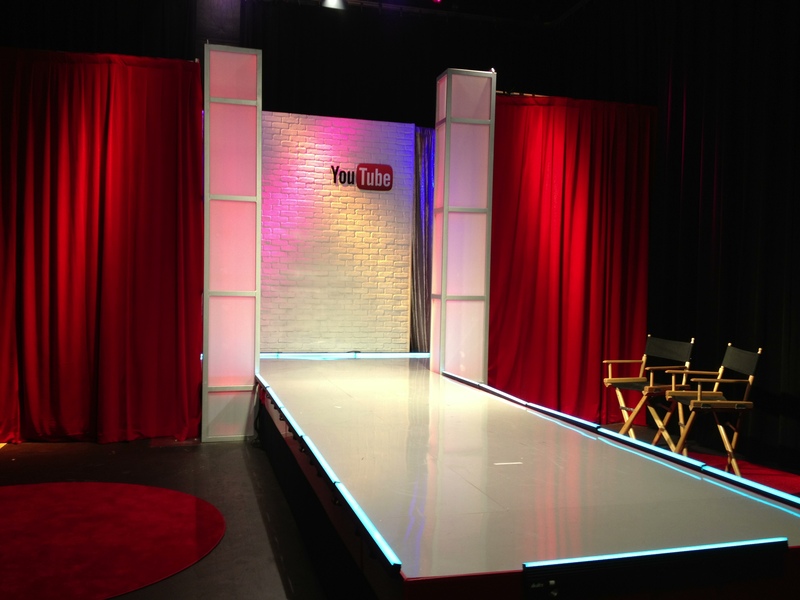 YouTube’s Los Angeles space has several stages, each one a different size and can be used for multiple purposes. The biggest stage it has is 6,000 square feet and is rather imposing — almost like you could film a talk show in the room. Polonsky says other stages have been used for fashion shows, comedy shows, and classes. Set building is also available as we saw desks, assembly parts of a makeshift castle, and much more. 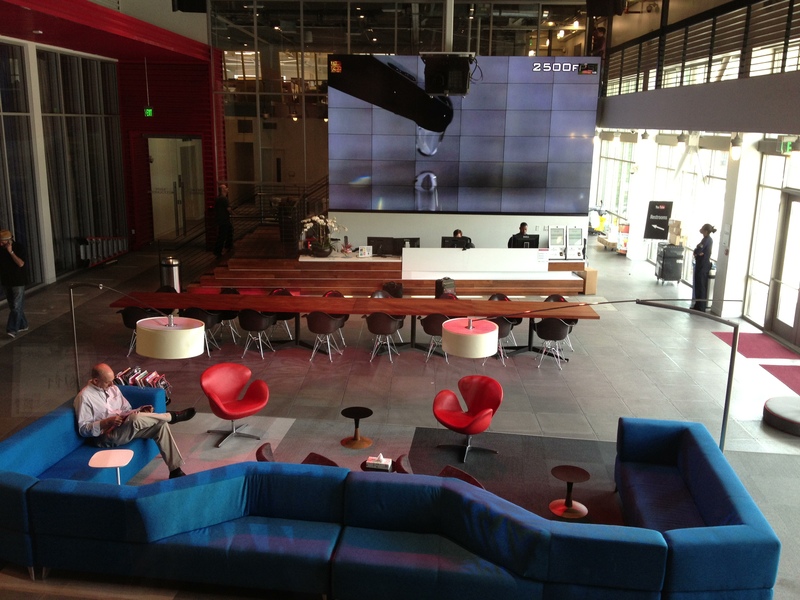 In total, we looked at 11 areas at YouTube’s creative space. Besides the 6,000 square foot stage, creators can take advantage of 2,500 and 1,500 square foot stages, three green screen studios, a motion capture studio, a rehearsal room/dance studio, a 47 person 4k resolution screening room, and a 200 person outdoor screening room and amphitheater. There’s also a production equipment bay in the back of the facility where creators can actually rent gear and other video needs. Once filming is complete, they can then take their recording and edit their video in a provided post-production room. The Internet there is pretty fast, rightfully so, but Polonsky wouldn’t reveal its speed. 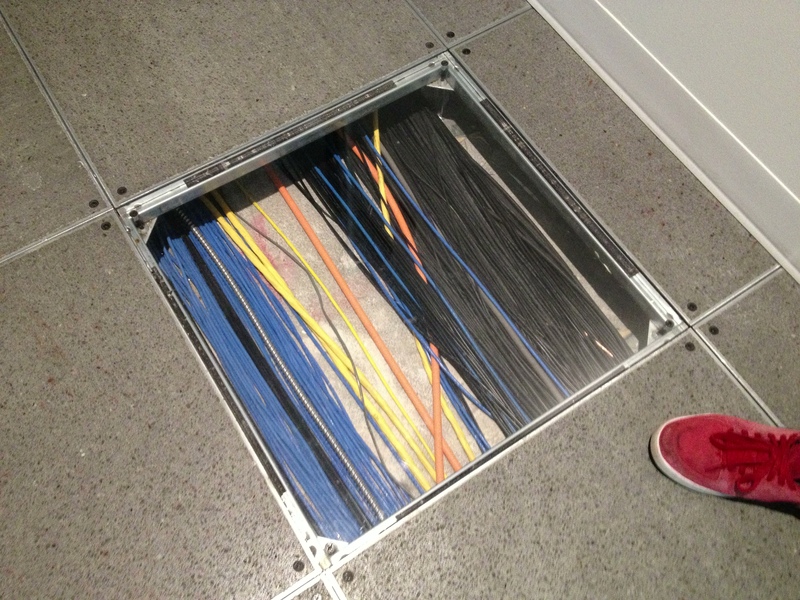 The amount of cable that goes through this building is extensive as well — with enough ethernet cables to run from Los Angeles to San Bruno, CA. The space doesn’t offer just resources to create a video. It also provides periodic workshops and social gatherings to help creators collaborate with one another. In July as an example, there are classes planned on how to improve a channel, monetize videos, and understand analytics. What does Google and YouTube get out of making this space available to creators? Nothing, well with the exception of more viewership on the social network. Anything created at the Los Angeles space is 100 percent owned by the creators — YouTube doesn’t take a percentage or own any rights from it. YouTube reaps long-term benefits when it helps better, more professional-looking content be uploaded to its site and seeing more page views. It winds up being a win-win for both parties. YouTube sees more traffic and their advertisers get more clicks on their ads, resulting in Google making more money. The space is located just down the street from one of the FOX studios and others. What does this mean for the television, movie, and broadcast industries? It shows that YouTube is serious about making itself more than simply a place where anyone can upload an amateur video. After eight years, the social network has got that part down pat — users currently upload 100 hours of video each minute. Now, YouTube is taking a bit more of a professional approach and offering a unique service to those making money off of their videos. The company already offers revenue sharing with its Partners Program participants, so now it’s seeking to help bolster the quality and production value so that, in a sense, could further emphasize its role as a true disruptor for broadcast television. There’s no disputing that a lot of activity is taking place on YouTube. Its popularity is amazing — billions of hours are watched every month. YouTube has become one of one of the main hubs of information that we can’t normally find on network television. For those that were interested in watching Texas state Senator Wendy Davis filibuster over abortion rights, they turned to the Internet, not traditional news powerhouses like CNN, who was chastised over its segment about blueberry muffins during the same time. YouTube has made it possible for anyone to air their thoughts, with some creating a buzz and generating more traffic than through traditional media. The social network is also branching out by creating original content for people to watch live on its site. Polonsky tells us that the YouTube LA studio was the spot where many of its Comedy Week videos were broadcast from. The addition of channels and other features to encourage more users to create videos will only help bolster YouTube’s position as broadcast mechanism, potentially pushing television into obscurity. 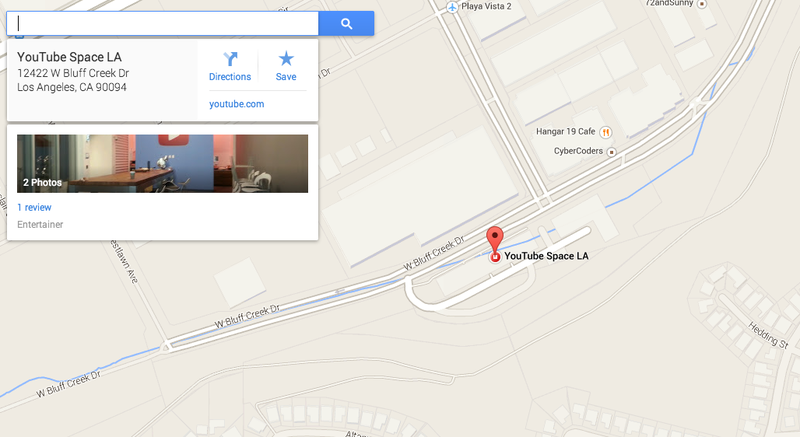 Will YouTube bring its creative studio space to other locations? Quite possibly. We tried to find out where specifically, but Polonsky wouldn’t give up the goods. But wherever many of its creators are located could be a good sign, whether in New York City, Toronto, some place in South America or Asia, who knows? If you’re interested in being a part of YouTube’s Los Angeles space, you can submit an application here.